Nella foto il nostro gruppo assieme a quello di Pandino (MI) venuto in visita. I started to attend Scouts at the age of nine years. My parents have discovered scouting through their friends and then my dad went to read up on the internet. The first time I went I was ashamed a bit ‘, so I did not really want to go. I open a small parenthesis, I give you a friendly advice. Sometimes happens, even when I’m tired after a week of school or other commitments, that I don’t want to go, so… I say, we must not consider only this feeling and say, no .. I don’t go! that’s not how to become stronger.., we must continue to fight, to go and then to say, well.. I have committed myself… now I am self-satisfied for what I have done. However now the continuous speech. After the first day of practice I liked. Initially to go to scout is to have fun and be with friends outdoors. With time you learn more and more technical stuff, how to make knots, pitch a tent, how to cook, how to light a fire without a lighter, etc.. After a bit of time, you make the Promise, the process by which you becomes part of a great community. From now on all the other scouts are now as brothers. You have to recite the text of the Promise and the Law. The laws are ten, are very important within a group, …as it would be Italy or your country without the law? a real mess. The symbol of the promise is the scarf that changes color depending on the degree. On the way, you can also specialize yourselves in specific activities such as cook, storekeeper, secretary. etc. Currently I’m the leader of my group, the Bear. A fairly difficult task. You must first pass various tests such as to be a scout of the second class and many others. If you come in our association I can assure you that the fun never fails. We are planning many beautiful initiatives including going to Gardaland, visit the Castle of Marostica, a day in the mountains to go skiing. 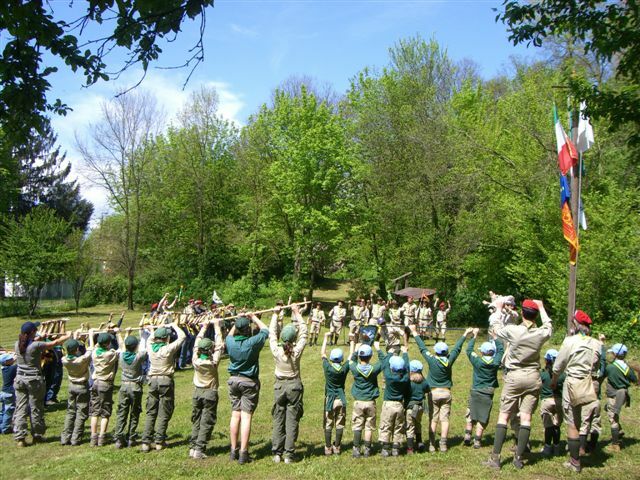 The group is called SCOUT GROUP INDEPENDENT VICENZA. You can find more information on the internet. This Saturday (November 20 th 2010) we go to visit the Castle of Marostica with a guide who will make us go round the city, we’re going to see how the walls were made and many other things. In our association there are two patrols of scouts and if you want to come I would be very happy because we always do some races and with your help we can win some more. If you have any questions I am here at your disposal. uau che bello!!!!! Quando Andrea sarà più grande mi piacerebbe che frequentasse il gruppo scout!!! MAgari tu sarai uno dei capi!!!!! Complimenti anche per l’impostazione del racconto. Bello!!!! Ciao Caio da Carla Massimo e Andrea!! Grazie mille del complimento , mi piacerebbe molto diventare un capo scout e insegnare ad Andrea.